Domenicali says the Urus will attract a new group of customers to Lamborghini. Lamborghini is preparing to shake up its business with the launch of its first SUV. The Urus is expected to double the supercar maker's sales to 7,000 units by 2019. Now the company is deciding whether to add a 2+2 GT sports car that could, by the end of the next decade, push the Audi-owned brand's sales above 10,000 for the first time in its 54-year history. 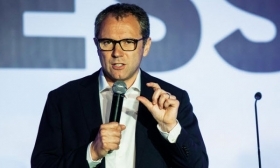 Lamborghini CEO Stefano Domenicali, 52, discussed these topics and more with Automotive News Europe Editor Luca Ciferri. The auto industry is undergoing major changes. What will Lamborghini look like a decade from now? We are adding our first SUV, the Urus, which will make Lamborghini relevant to customers who never considered us before. We are also currently investigating a 2+2-seat GT that would add space and comfort to the super sport performance we offer in that sector. At the same time, we are shifting toward electrification, first with plug-in hybrids and, when battery technology will permit Lamborghini-style performance, also pure EVs. As the industry shifts toward SUVs, do you fear that your customers may trade in their Huracan or Aventador to buy an Urus? Since a Lamborghini customer owns an average of four to six cars, including at least one SUV, we envisage him replacing his current SUV with a Urus and keeping his Huracan or Aventador. We do not see cannibalization between these Lamborghini products, because the Urus is a daily driver while the two-seaters are rarely used on an everyday basis. Lamborghini has built just one 2+2 model, the Espada, which was launched in 1968. Since then, the company had been struggling to create a successor. Why? Combining high performance with interior space and driving comfort in a package that, design-wise, should be striking as well as highly efficient in terms of aerodynamics isn't easy. Therefore, I'm pushing the company to shorten our time to market from the current 48 months to about 34. I want to freeze the design as late as possible to be as current as possible on the latest trends and avoid any mistakes. If the 2+2 GT is approved, when would it arrive on the market? Volume-wise, it could take Lamborghini to about 10,000 units, right? Lamborghini has shown two 2+2 GT concepts in the last decade: the 2008 Estoque and the 2014 Asterion. Do they provide any hints? What we have in mind is completely different, but the Asterion is the closest thing we have publicly shown so far. What powertrain would work best? The Aventador's V-12 is ruled out for package reasons, thus we are currently debating between the Huracan's V-10 and the Urus' V-8. A normally aspirated V-12 is part of your DNA. Will it survive the move to downsized turbocharged engines? The next Aventador will have a normally aspirated V-12 coupled with a plug-in hybrid. Given that the new car is some years away and that we have an average product cycle of eight years, we will continue to offer a V-12 for a while. Which model will be your first with an electrified powertrain? The Urus will have a plug-in hybrid variant that will appear in early 2020. The successors to the Aventador and Huracan will come only as plug-in hybrids. This is the only way to maintain performance and keep Lamborghini's engine sound while also reducing emissions. We do not see the right balance of size and weight to deliver enough performance and range for a Lamborghini based on current and future battery technology. That is why we are exploring a new type of super capacitor with the Massachusetts Institute of Technology that could permit Lamborghini-style performance. When could such a car become a reality? Hard to say, but probably not sooner than 2030. I think a company must invest both in expanding its current range as well as looking into the distant future to avoid being left behind. Isn't this a bit of a stretch for a company that, despite setting a new record, sold just 3,457 supercars last year? We are part of an extraordinary group that sells 10 million vehicles a year and that is heavily investing in Lamborghini because it believes in our plans. Therefore, I am far from worried. When I tested the Urus on the Nardo high-speed track, I was genuinely pleased because we were able to deliver on what we have promised. Now it is up to the market to judge our work, but I am very optimistic.